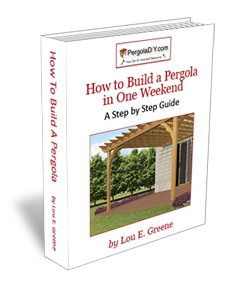 One of the original uses of a pergola historically has been as an arbor or as a structure connecting walkways covered in vines (known as pergola vines). These often provided a connecting link between the many sections of large garden estates. This vine-covered pergola is a classic example of the Old World version. Another traditional method is having vines for trellises. The posts are set in brick lined bases and support beams that are then connected with joists and laths provide dappled shade and the perfect foundation for the plants growing around it. The treated wood is stained to give it a natural, weathered look. 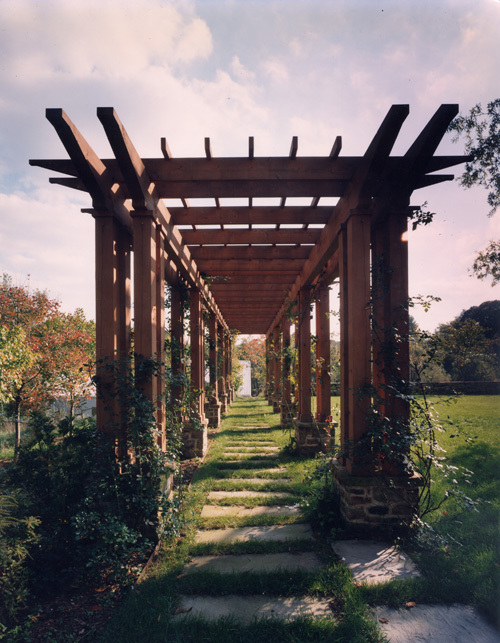 It creates a very romantic and elegant look to this walking path, as you can see in the pergola picture provided above. Most pergolas wont look quite this fancy. Rafter and beam overhangs are normally much smaller, though these longer extensions are certainly an option even for a basic backyard pergola. Care would need to be taken when measuring the pieces to make sure the extended overhang doesn’t obstruct any other views or get too close to trees or other parts of the house. Also, spans that are too long can sag so beams any longer than sixteen feet end to end should be supported by more than two posts.